IIIT BASAR RGUKT Admission Notification 2017 has been announced by the Rajiv Gandhi University of Knowledge Technologies Officials in April 2017. RGUKT invited the online applications from the eligible students for admission into first year of 6-year integrated B.Tech Degree programme for the year 2017-2018 being offered at the university constituent institutes at Basar. 5% supernumerary seats are also available for the students belonging to States other than AP and TS including the Children of Indian Workers in Gulf Countries / International and NRI students. RGUKT offers a 6- year Integrated B.Tech course in six engineering disciplines viz., Chemical, Civil, Computer Science Engineering, Mechanical and Metallurgical and Materials Engineering. Teaching and learning is ICT based and it is fully residential with separate hostel facilities for Girls and Boys. Every student is being provided with a laptop. Eligible candidates were applied for this stream as per its schedule. The candidates who were applied for this notification, they are anticipating for their results. We know that these admissions are made based on GPA and Grade obtained in each subject of student. After that the selection process has been completed by RGUKT Officials. 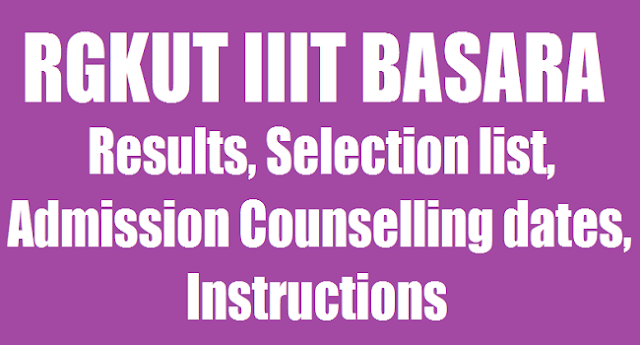 RGUKT BASAR IIIT Selection List to be released on 12-06-2017 by the RGUKT Admissions 2017 officials. Now counselling for shortlisted candidates in the open and RGUKT IIIT Selection list of Candidates for selected for admission into first year of its 6 year B.Tech integrated programme 2017 at RGUKT located at basar. Along with the shortlisted candidates, IIIT officials also released the wait listed Candidates. Shortlisted candidates who do not attend the counselling as per announced dates will sacrifice their for admission. The counselling for waiting list candidates will be held in July to allot over seats. RGUKT Counseling Instructions for Provisionally Shortlisted and Waitlisted Candidates will be provided soon here. We have known very well how the career graphs increases, if we enter in to IIT, III TS because future is with them. The students with perfect outcome will glitter like stars and leads luxurious life. But this skills, outcome depends on the institution that we choose. So, parents are worried about their children either they will achieve seats in better colleges. This RGUKT mainly helps backward, rural area, govt school children. So, they should utilize this golden chance. The merit list of BASARA RGUKT to be released. Where each campus have 1000 seats out of 1000, merit list of students to be released in Telangana. Counselling on July 19, 20 will be conducted for selected students, and for special category children in July last. a. The list of candidates selected for counseling will be displayed on the University website www.rgukt.ac.in or www.admissions.rgukt.ac.in. b. The candidates will also be informed by post, e-mail and SMS message, wherever possible, to the address/mobile number written in the application form. a) The candidates selected for counseling shall report in person at RGUKT - Basar, Nirmal District in Telangana State for verification of original certificates / documents and the details provided in the application form. b) Counseling and selection for admission in respect of candidates belonging to the Special Categories like Physically Handicapped (PH), Children of Armed Personnel (CAP), NCC and Sports will be conducted at RGUKT- Basar. Admission to the first year of 6-Year Integrated Engineering course in the University will be granted only after satisfactory verification and scrutiny of the details mentioned in the application and the original certificates / documents submitted by the candidate at the counseling center. Mere selection for counseling and verification of certificates / documents will not guarantee admission to the candidate. a) The tuition fee for the candidates who studied in Schools situated in Telangana & Andhra Pradesh States is Rs.37,000/- per annum (It includes Rs.500/- examination fee per semester). b) Students who are eligible for tuition fee reimbursement as per the guidelines issued by the respective State Governments need not pay the tuition fee (Students whose parental annual income is below Rs.1.0 lakh for non SC/ST category and below Rs.2.0 lakh for SC/ST category and who fulfill the other conditions as per the latest Govt. rules are eligible for fee reimbursement). c) Every student has to pay a registration fee of Rs.1,000/- (Rs.500/- for SC/ST candidates) and a refundable caution deposit of Rs.2,000 (by all), and medical insurance of Rs. 500/- approximately per annum for first two years (by all), that is a total of Rs.3,500/- (Rs 3,000/- in case of SC/ST candidates) at the time of admission. All the candidates who studied in TS/AP Model Schools are considered under Non- Residential Govt. School category by adding 0.4 deprivation score, hence a confirmation letter from the Principal/ Head of the institute which certifies that you are a “Non- Residential students of TS/AP Model school” must be produced at the time of counseling. The certificate format for the same has been annexed at the end of this document, failing which the admission stands cancelled and the seat will be allocated to the next best candidate. Selection List for General Counselling Schedule/ IIIT RGUKT Results, Selection List/Shortlisted list for BTech Degree admissions 2017. Sub: RGUKT – Basar, UG Admissions 2017 – Call Letter for Counseling - reg. We are happy to inform that you have been provisionally selected for counseling for admission into 6 -Year Integrated B.Tech Course of Rajiv Gandhi University of Knowledge Technologies (RGUKT), Basar for the Academic Year 2017 -18. The following are the Instructions to the candidates provisionally shortlisted for counseling and are requested to read them carefully. along with the original documents/certificates mentioned below, without fail. It is the responsibility of students/parents to make all suitable travel arrangements so as to reach the University by 8.00 AM on the above said date. Admission shall not be given, if the student fails to attend the counseling in person on the above date and time for whatever reason. The seat will be allocated to the next best candidate. Mere attending the counseling does not guarantee a seat. Admission will be given only if they fulfill all the eligibility criteria and pay relevant fee after the verification of original certificates / documents. The selection stands cancelled in case candidates fail to produce the original certificates mentioned below at the time of verification or fail to pay the relevant fee. sets of the Xerox copies. 3. SSC Transfer Certificate and Conduct Certificate. However, in the event of already taken admission elsewhere, the candidate can be given time to produce TC within two days or latest by 23.06.2017 giving an undertaking to that effect, failing which the admission stands cancelled. 5. Candidates claiming admission under Non-local Category have to submit a Residence Certificate as a proof to effect that the candidate have resided in the state for a total period of 10 years excluding periods of study outside the state or either of whose parents have resided in the state for a total period of 10 years excluding period of employment outside the state. 7. Income Certificate (latest & issued after 01.04.2017 from Meeseva Only). The admitted students have to report to the University on 30.06.2017 and classes will start from 01.07.2017. Late comers won’t be permitted. The admitted candidates shall come prepared to stay for the entire first semester from that date. B.Tech programme of the University. Note: Students who are eligible for fee reimbursement as per the stipulated State Government rules need not pay tuition fee of Rs. 36,000/-. (Students, whose parental annual income is below Rs.1.0 lakh for non SC/ST category and below Rs.2.0 Lakh for SC/ST category on fulfillment of the other conditions and eligibility criteria for fee reimbursement as per the latest Govt. Rules). But in case, if they are not reimbursed the tuition fee, they shall have to pay the tuition fee before the commencement of Sem-2 examination in the academic year in order to permit them to appear in the exam. 09:00AM to 05:00PM, on all working days. VII. The candidates selected for admission shall be prepared to go through the intensive learning programme at the RGUKT, and will have a fruitful learning time leading to a bright career. VIII. The candidates selected for admission need to sign a declaration concerning the rules and regulations of the RGUKT at the time of admission. Note: This selection is for counseling and as such does not guarantee admission to the course. Admission to the course will be given subject to verification of all your original documents and fulfillment of the eligibility criteria. In case of any tie exists among the candidates, the seat will be allocated on the priority order followed by RGUKT Admission Rules. Note: The claim of registered applicants whose GPA has been further improved in recounting / re-verification process of X class results, may be considered under waiting list upon submission of their improved grade sheet and certificates on or before 20th June 2017.